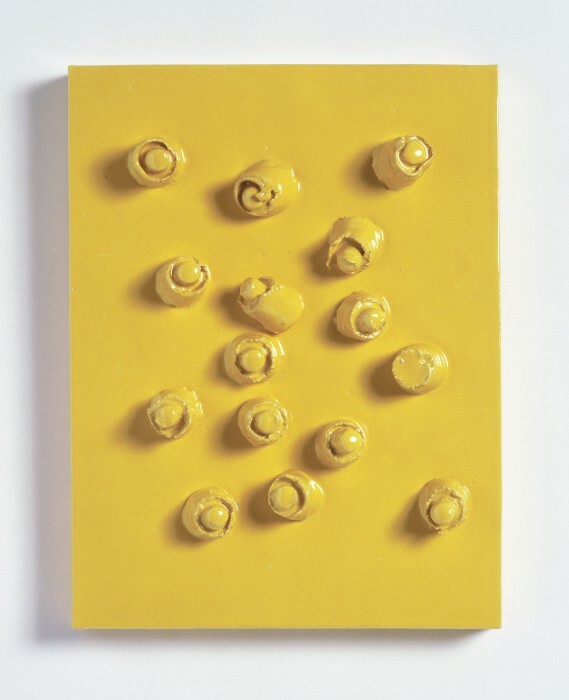 David Kordansky Gallery is very pleased to announce Migraine, an exhibition of new work by Swiss artist Mai-Thu Perret. The exhibition will run from April 2 until May 7, and the opening reception will be held on Saturday, April 2 from 6:00 to 9:00pm. 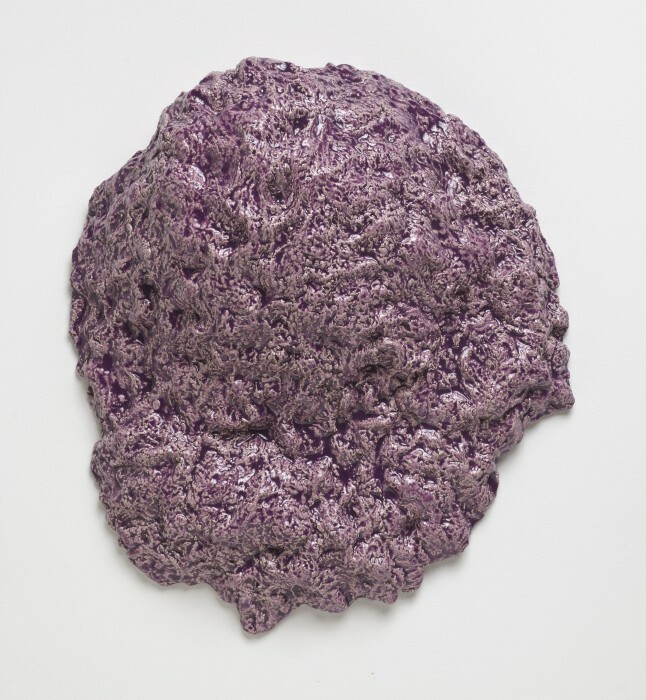 A re-imagination of the possibilities of the painting exhibition as seen through an expanded critical lens, Migraine will feature paintings made on carpet supports and both wall- and floor-based ceramic sculptures. The exhibition’s title evokes the auras that accompany the onset of migraine headaches, regarded as moments when the brain’s optical processing reveals itself, and hints at the neurological origins of abstraction and visual patterning. As she explores the intersections between modernist form and applied genres such as craft, fashion, and theater, Perret creates work that often relates to an ongoing narrative she calls Land of Crystal. This fictional text-as-artwork describes the life and work of a group of women who have created an autonomous, utopian community in the New Mexico desert. The resulting sense of implied utility lends Perret’s works a mysteriously tactile presence, and the women who populate her imaginary community become stand-ins for both viewers and makers, consumers and producers. By using fiction as a generative artistic tool, Perret engages histories of feminism, revolutionary societies, and modern design. She thereby raises questions about how objects function within (and also influence) the social systems they inhabit. In the paintings on view in this exhibition, Rorschach-like forms have been inscribed on carpets with varying degrees of texture. The combination of abstract imagery and non-traditional surface bring competing notions of formalism and utility into direct juxtaposition: as the carpets are transformed from floor-based furnishings into wall-based supports, they carry with them vestiges of their original, domestic purposes. The vertiginous, mandala-like nature of the forms also establishes connections between mid-century abstraction and a decidedly more psychedelic take on opticality. They are examples of serial painting made strange, on both visual and physical terms. 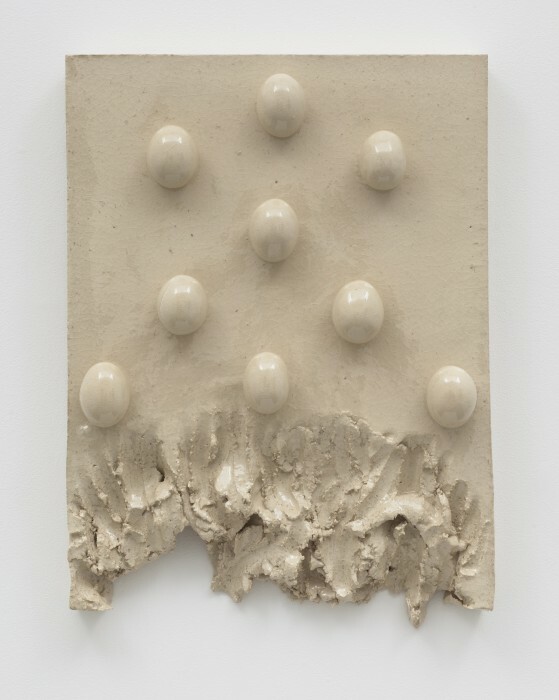 In this context, Perret’s wall-based ceramic objects can perhaps be read as congealed paintings, or fossils of paintings. They include representational shapes (such as eggs, skulls, and heads of hair) as well as non-representational ones (grids of circles, biomorphic conglomerations, and geometric forms informed by artistic predecessors like Robert Smithson). 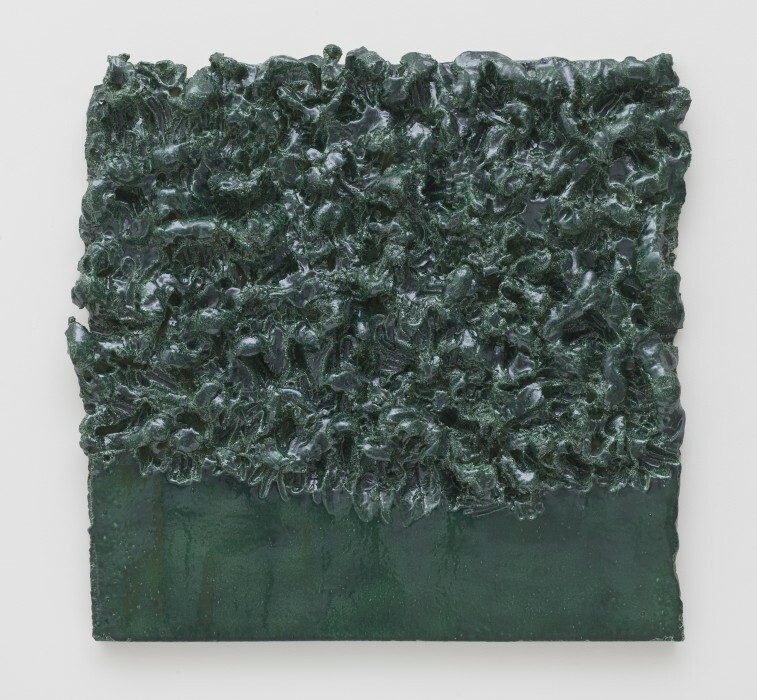 The diversity of these works highlights the plastic nature of clay, a material that offers much more mutability than pigment applied to canvas; however, that mutability disappears completely as the works are fired. 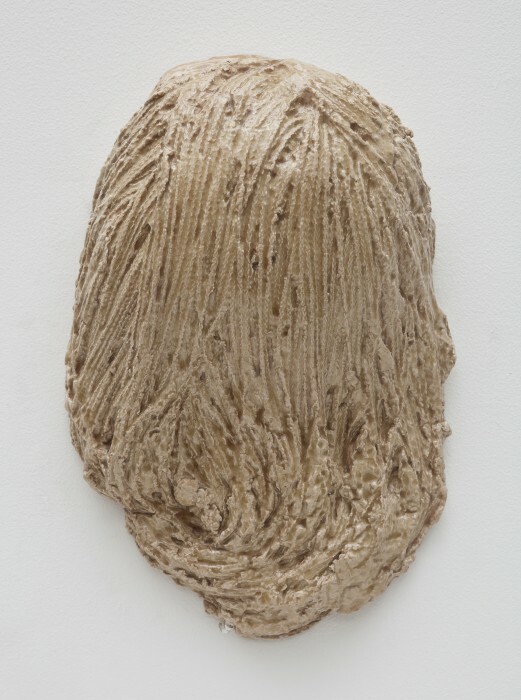 By bringing clay into direct relationship with painting, Perret identifies this moment of crossing, when the physical status of the artwork transitions between flux and finality. 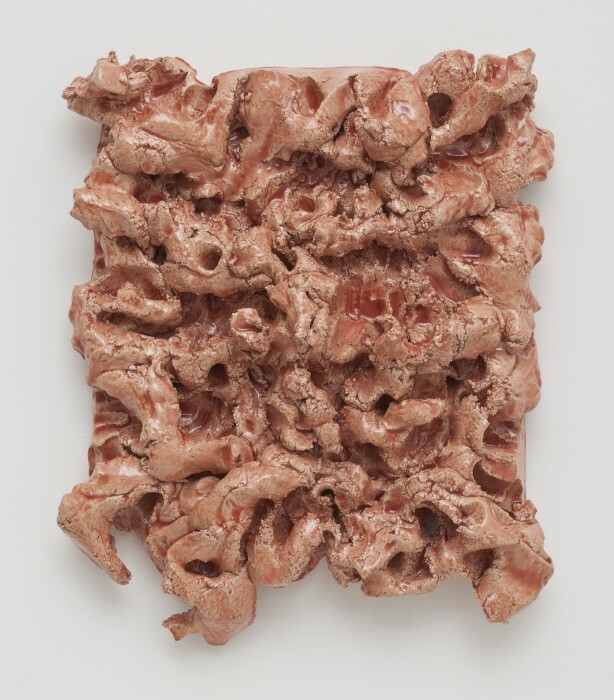 In floor-based ceramic works, that process becomes a matter of sculptural concern. This can be seen with particular acuity in a pyramid-like pile of white ceramic eggs. Reminiscent of a hive, its ovoid units seem to articulate an area of physical and psychological intensity, one in which a paradoxical strength born of fragility is literalized. Since 2008 Perret has titled the ceramic objects with what are known in Zen Buddhism as ‘capping phrases.’ Used as stock fragments to encapsulate a monk’s insight into a koan, these examples of found poetry point to the contradictory nature of language. Phrases that traditionally function as spiritual shortcuts become a way of understanding how these objects exist both inside of and outside of the artist’s Land of Crystal text, and how artworks in general relate to the language developed to explicate them. A major new table-like sculpture, made from kiln-fired refractory concrete, takes its inspiration from furniture designer Enzo Mari’s 1974 treatise Autoprogettazione. Mari laid out plans for furniture objects that could be built with the most basic materials and construction techniques. At once a mode of empowerment and a critique of industrial commodification, Mari’s work would seem to dovetail naturally with Perret’s interest in utopian master narratives. However, the sculpture perverts the populist intentions of the original design by converting it into a unique art object. Pure functionality and pure form are brought into uneasy relation; their combative history becomes a source of shared future potential. Later this year, Mai-Thu Perret will be included in ILLUMInations, the exhibition curated by Bice Curiger for the International Pavilion at the 54th Venice Biennale. 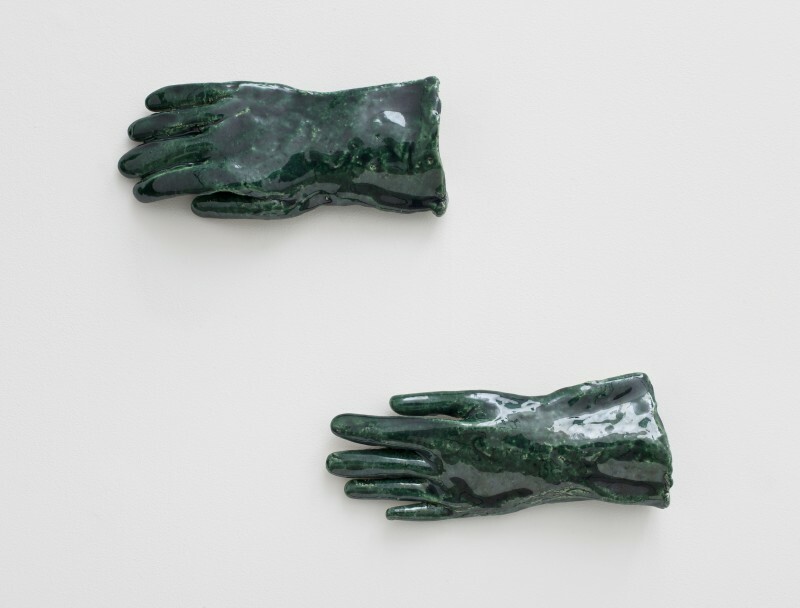 Perret was recently awarded the Zurich Art Prize; an associated solo show dedicated to her work will open at Haus Konstruktiv, Zurich, in August. In 2011 solo exhibitions will also take place at Mamco, Geneva, Switzerland; Le Magasin, Grenoble, France; and Aargauer Kunsthaus, Aarau, Switzerland. Recent solo exhibitions include An Ideal for Living, University of Michigan Museum of Art, Ann Arbor, Michigan; 2013, Aspen Art Museum, Aspen CO; New Work, San Francisco Museum of Modern Art; An Evening of the Book and Other Stories, The Kitchen, New York; and Land of Crystal, Kunst Halle Sankt Gallen, St. Gallen, Switzerland. In the past few years Perret’s work has been featured in numerous group exhibitions, including Abstract Possible, Malmö Konsthall, Malmö, Sweden; Goldene Zeiten, Haus der Kunst, Munich, Germany; Heaven-Splendid Isolation, 2nd Athens Biennial, Athens, Greece; and A Spoken Word Exhibition, Baltic Center for Contemporary Art, Gateshead, England, among many others. 2011 will also see the release of Mai-Thu Perret, a monograph published by JRP|Ringier that includes texts by Diedrich Diederichsen and Elisabeth Lebovici. Images courtesy of David Kordansky, Los Angeles. Photos by Brian Forrest.